Sly says he was very, very lucky to meet an extraordinary woman, his current wife Jennifer, and that she really did just open up a whole new world to him. She really changed his life. He says, "When I first met Jennifer, she was just 19 years old. She was totally unlike any woman I ever met before, and it was love at first sight." "She was a model, but hated the vanity of it all and loathed going to parties. When we met, she had never been to Hollywood before. "While incredibly attractive, Jennifer was very quiet – almost nerdish. I don’t think we said five words for the first five years because she was so painfully shy. And that’s absolutely what I fell for." in even the worst blows I might receive these days". She knew the action star was the man for her when he made no comments about her bad skin. Jennifer lost modelling contracts because her acne was so bad, and her problems were at their height when she fell for Stallone. "My skin was always broken out when I met him and he was the first person in my life that didn't care". 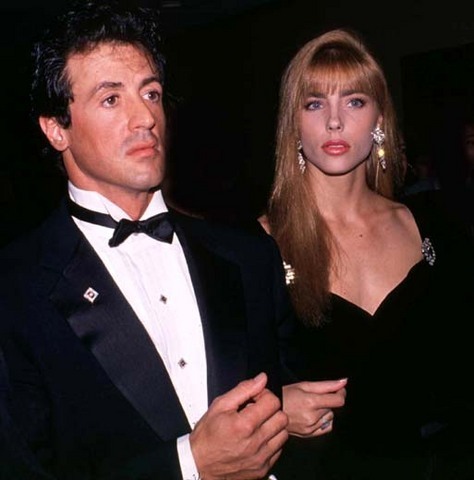 After failed marriages to Sasha Ash and then Brigitte Nielsen, Sly had almost given up on love before he married model Jennifer Flavin in 1997. "I went through a real period of depression and disillusionment and thought I would never get married again," he admits. "But meeting Jennifer has proved never say never. Conscious of how lucky he is to have found his soulmate, Sly does everything he can to make his wife feel a million dollars. That’s the key to Sly’s successful relationship – leaving his wife in no doubt as to how much he loves her. "It’s so important to remain flirtatious with one another," he says. "I’m always touching, kissing and caressing her. I just can’t keep my hands off her!" Three years after marrying the father of her two daughters, Jennifer Flavin-Stallone is a radiant wife and mother, confident their troubles are in the past. “Our being married has made a big difference to me. I’m the marrying type. I’m not really good at being the single girl. I didn’t get married just to get married. I married the man I’ve been in love with for 12 years,” says 31-year-old Jennifer.